The HS507C Micro Red Dot System from Holosun is a pistol-sized optic with an open frame for a great sight picture, clear glass and a rugged 7075 aluminum housing. It is powered by a CR2032 battery and Holosun's innovative Solar Fail-safe back up. The HS507C will run up to 10 years on a single battery on setting 6, dot only. Featuring our Multi-reticle system, the HS507C allows the operator to switch the reticle between a 32 MOA circle with 2 MOA dot, a 2 MOA dot only, or a 32 MOA ring only, all at the push of a button. Better yet, the same LED projects all three reticles, so no re-zeroing is necessary. It comes equipped with Holosun's Shake Awake technology with last setting recall. This optic has our features in one tough, small package. 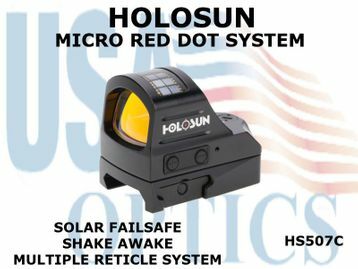 ➢ Solar failsafe - Holosun was the first to innovate the ability to run an electronic optic solely on the power of light! Our units equipped with this feature give you the confidence that in the instance that you find your battery has failed, you still can have a fully functional optic provided you have sufficient ambient light. It does not matter whether the light is natural or artificial in origin. Furthermore, the solar array also acts like a light sensor allowing the unit to automatically adjust the brightness to compensate for its surroundings. ➢ Shake Awake - Another great piece of technology created by Holosun is Shake Awake. This great feature allows an optic to automatically go to sleep when the unit has not detected any type of movement or vibration in a specific amount of time that is programmable by the operator. However, once the unit senses movement, it will automatically turn itself on and recall the last brightness that was used. This great feature helps promote battery life further and insures the unit is on and ready when you need it! ➢ Multiple Reticle System (M.R.S.) - M.R.S. gives the user the flexibility to use their optic as they need it. Units with this feature allow the user to turn on or off certain sections of the reticle giving the ability to have the ideal reticle for the job at hand. If you need a precise shot, you can run the 2MOA dot only. You need a reticle for fast target acquisition, just turn on an additional 65MOA ring with the push of a button! The best part....no need to rezero your optic when switching between reticle options!